Did you know that you're more likely to die in an accident involving a sandcastle than you are from a shark bite? Or that a decapitated cockroach can survive without food until it eventually starves to death? If that's not enough to pique your interest, how about the fact that an adult foot produces a quarter cup of sweat per day, that's over two shot glasses full! We're sure your lives are already enriched by these weird and wonderful facts, but what if we were to offer you two hundred more? Well, we've done just that and you have in your hand a collection of some of the funniest, grimmest, grossest, grimiest, bizarre, disgusting, outrageous and outstanding nuggets of information on the planet. 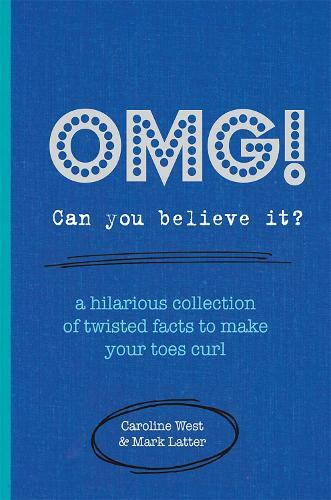 Each one will have you scratching your head in disbelief and laughing out loud at the randomness of it all. So if you've never heard of Miracle Mike, the chicken that survived for 18 months despite not having a head, then take OMG! Can You Believe It? straight to the nearest till and buy immediately!